Oh, Metalcore, I mourn for those who never knew you. Glorious was the heyday of such then-gigantic core ‘core acts as Killswitch Engage, All That Remains, Shadows Fall, etc. The alchemy of fusing melodeath-inspired riffage and radio-friendly songwriting yielded far more quality results than one might expect or willingly concede, yet the saturation and over recycling of this formula ultimately failed to maintain the staying power of its trve idols. Nonetheless, it’s still a thing, so people are still doing it. In Germany, Burden of Grief are hard at work being that collective guy, and Eye of the Storm is their latest journey back to the days of olde. 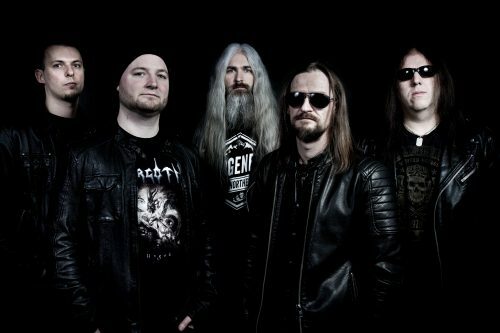 Dissonance seekers move right along; the Storm isn’t “true” -core but rather “that” -core, 11 tracks of Gothenburg melody doled out in easily digested verse/chorus/verse/solo/chorus bites. Mid-era In Flames fused with Killswitch riffage is churned and chugged out with a healthy Hypocrisy hue at the hands of Philipp Hanfland and Johannes Rudolph, the pair unloading lick after lively lick and leaping straight at my nostalgic heart-thing all the while. Drummer Sebastian Robrecht likewise knows what’s up, unleashing a percussive fury reminiscent of Chimaira and giving zero fucks for tranquillity (you know, other than the Dark kind.) That Mike Huhmann’s screams hearken to modern At the Gates is only appropriate, and his execution and staunch avoidance of vocal hygiene serve the Storm admirably. 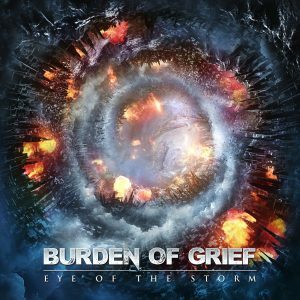 Burden of Grief are clearly loyal minions of the metalcore masters, but does that even matter in the post-djentocalypse pre-apocalypse shitscape of the now? If riffs and righteous, rhythmic chugging redolent of the ashes of In Flames are your thing, then fear not/less: Eye of the Storm is as top notch ‘core as can be found here in the future. The title track takes a trip back to that all important tonal time when In Flames rerouted to remain relevant and holds on to that moment with a deathgrip on yesterday, instead of providing a soundtrack to escape from. “Killing Spree” may not be an exercise in wheel transformation, but it’s right at the gates between metalcore and melodeath riff greatness, and if it doesn’t make you bang your head then I simply don’t trust you. True to form, “Wolf Moon” will likely blow zero minds, and yet its In Flames energy is certain to leave many a neck sore. Eye of the Storm sees five dudes doing melodeath things in metalcore ways for 42 minutes, and though there’s not much new ground covered here, it’s also undeniable and very much in Burden of Grief‘s favor that the band manages to maintain a sound of their own amidst such well-trodden sonic scenery. This paradoxical nature of the album made assigning it a rating somewhat difficult. It was solid, yet ever changing. It was different, but yet the same. We already know the metalcore formula a little too well by now, and the bands refusal to branch too far from that path leaves the overall impact of the Storm a bit underwhelming with its distinct lack of surprises. What is surprising is the distinct lack of noodly leadwork when the band is clearly following footsteps that typically favor such fare; solos are as much a part of the formula here as in any of their idols’s world, yet Eye of the Storm shies away from the fret-board frenzy that gave bands like All That Remains or Shadows Fall that extra oomph the elite relied on when justifying their invariable love for the ghosts of metalcore past. However, there’s more than enough going on in any given track to ease the stings of conscience that come from ‘core conformity, and Huhmann’s wrathful energy keeps things heavy and engaging enough to ensure that this storm is still one worth chasing. With a little more zazz and a few attempts made to at least nudge the envelope, Eye of the Storm would have owned the early 2000’s without question. As it stands, Burden of Grief have arrived at this particular party perhaps a bit later than advisable, and yet I find I have no desire to tell them to go home. As bands like All That Remains and Killswitch Engage fall deeper into the arms of sorrow and hasbeenery, there’s something endearing in seeing the scene kept alive and not just breathing. Though it may not bring anything particularly innovative to the table, Eye of the Storm is a fine display of modern Killswitchcore that also pays heavy respects to the melodeath of their day, an excellent temporary end of the heartache that comes with leaving the past behind.